JUPITER, Fla. - It's not like Abacoa Golf Club stands empty most of the year. But come February and March it's as crowded as Peyton Manning's post-Super Bowl bandwagon. Spring training time or not, Abacoa Golf Club in Jupiter is a worthy play. That's because this might be the most spring training-centric golf course in the world. Many courses advertise a baseball link this time of year. 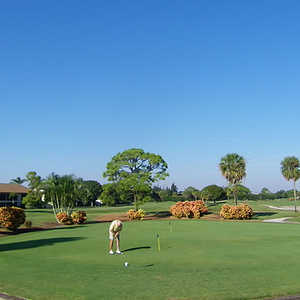 Abacoa G.C. lives it. The St. Louis Cardinals and the Florida Marlins train at the practice fields in the Abacoa complex. Their stadium is a quick walk from the golf shop. "We get a lot of 7 o'clock to 8 o'clock play during spring training," Assistant Professional Brian Buckley said. "People who want to get done before the practice or games start. Then some of them will come right back and try to get in another nine around 3." But this is no gimmick course living off its diamond connection. Even if it weren't a seasonal ballplayers' haunt Abacoa would stand up as a worthy public play in a northern Palm Beach county area where ultra-private high-end clubs such as Frenchman's Creek rule. It was doing brisk walk-up business on a recent rainy, windy, definitely non-spring Sunday. "I like the course. It has a lot of different options," Chicago golfer Al Lori said. "I wouldn't play it again in this weather, though." "Want to go out again at 2:30?" his buddy Mark Reimers broke in. "Okay, maybe I will play it again in this weather," Lori laughed. Abacoa has a way of changing minds. It's not your typical flat Florida course. There are raised tees, shots down into fairways and shots up onto greens. Okay, it's not exactly desert golf. The raised tees are on little mounds, and the elevation change on any given hole maxes out at around 40 feet. Spend some time in the Sunshine State, though, and you quickly realize how big any elevation change is to local golfers. There could be a milk box on the tee and it'd be considered a major deal. "For Florida, it's a lot of elevation changes," Buckley said. 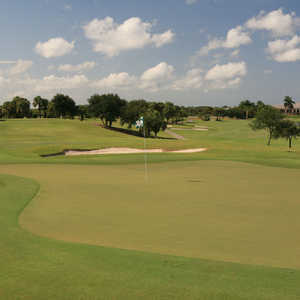 "You play the Frenchman's Creek courses - as nice as they are - and they're completely flat. Here we've got these lakes built up that create mounds." Prolific Florida course architect Joe Lee used the mounding, some sloping fairways and plenty of water to create a 7,200-yard course that's getting tougher as it matures. 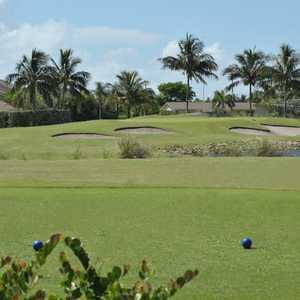 In the first few years after Abacoa Golf Club opened in 1999, "the fairways were hard and you'd get a lot of bounce on your shots that added distance and made it easier to score," Buckley said. "Now, as some of the trees are growing in more, it's become a more difficult course." When the winter Florida winds are kicking, Abacoa can play as nasty as a Chris Carpenter curveball. Which is pretty apt considering Abacoa Golf Club frequently mixes it up like the Cards' Cy Young winner. On the fifth hole - a 410-yard par-4 which has you shooting down from a raised tee into a slopping left fairway - there's suddenly a big tree in the middle of the fairway. It's about 120 yards from the green and can play more havoc with your approach than Mark McGwire's appearance before Congress did with his legacy. That's the thing about Abacoa: it's what you don't expect that's really going to get in your swing. Everyone seems to dread the long, long water carry on the par 3 13th (it's a 235-yard hole from backs, 184 yards from where most golfers play it). Yet, No. 18's lurking and almost guaranteed to cause more scorecard damage. This is a 457-yard par 4 with its own long water clear from the tees. Then it's up to a huge green on a hill right below the clubhouse that has bunkers larger than Dr. Phil's ego on three of its five sides and water on the fourth. That's right, there's one safe approach. One option. Adding to the pressure is the raised veranda seating outside the clubhouse, overlooking the whole thing. If it's February, don't be surprised if Marlins ace Dontrelle Willis is leaning over the side, mocking you. In a region where even the dogs wear Versace, Abacoa is worth its $130 high-season greens fee. It doesn't have stunning views, but if you've been playing a lot of flatland golf, seeing the ball fly a little off those raised tees is a treat. The greens are huge and usually run 10½ to 12 on the stimpmeter thanks to two hands-on individual owners who insist on fast greens. "I was surprised by those greens," Illinois golfer Dave Webb said. "In a good way." Abacoa can do that. This isn't stunning golf. You're in the middle of a big complex that includes a town center. On this day, music from a Mexican holiday celebration carried over to the course. Still, there aren't houses all over the places, spoiling your views from those miniature raised tees.